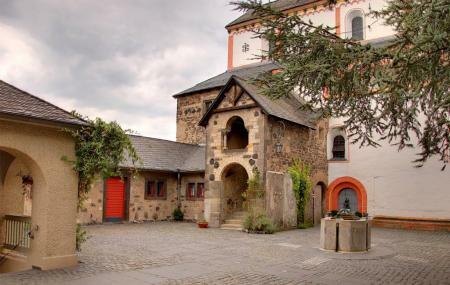 Find hotel near Doppelkirche St. Maria Un ..
Doppelkirche St. Maria und St. Clemens is one of the most important double Romanesque churchesin Germany. The Bonn church is a 12th century monument with high sentimental value for the locals owing to the connection with the Benedictine nunnery of Schwarzrheindorf.It is inspired by the designs of Charlemagne's Palatine Chapel at Aachen Cathedral and Church of the Holy Sepulchre in Jerusalem. Famous for its 12th century frescos, the DoppelkircheSchwarzrheindorf is located on a slopping terrace plot close to Rhine. The Upper church is dedicated to Virgin Mary- Mother of God while the lower church is ordained as Holy Clemens dedicated to Pope Clement I.It was commissioned in 1151 by Arnold II Von Wied as a private chapel and later turned into a monastery under the orders of his sister- Hadwig. The present site was excavated in the 19th century and restored in 1863. It figures in local maps as the Double Church of St. Mary and St. Clement. Use of camera inside the alley is prohibited. Wear slippers/ sandals as you may have to remove them to access some parts of the church. Always use the rails while taking a flight of stairs to upper levels. Some areas are restricted to only selected population as per papal regulations. How popular is Doppelkirche St. Maria Und St. Clemens? People normally club together MunsterBasilika St. Martin and Frauenmuseum while planning their visit to Doppelkirche St. Maria Und St. Clemens. A little gem from the 12th century. Visit if you are around! Very unique Romanesque church. It consists of an upper and lower church literally on top of each other. The upper church is only open for visits on weekends. Definitely worth visiting. Church from the 12th century. It is a double church, two floors, the upper one dedicated to Mary (Madonna) and the lower one to Pope Clement. Double churches are often related to different christian denominations using the same building (like Catholic/Lutheran double churches), but this seems not to be the case for this one. As I read, it is not yet clear how the two different floors were used. The Doppelkirche (Double Church) of St. Mary and St. Clement is a Romanesque church in Schwarzrheindorf, an eastern suburb of Bonn. Completed in 1151, the church has two levels and medieval wall paintings of saints and apocalyptic scenes. The Double Church of Schwarzrheindorf has an attractive exterior plastered in white and decorated with pink and yellow paint. The paint job dates from a restoration of 1973 and provides a good sense of what many now-bare churches looked like in medieval times. Inside, it has two levels: a lower church for the local community and an upper church for the lords of the castle and later the nuns. The two share the same plan: an apse with altar in the east end; small north and south transepts or apses; and a straight extension to the west for seating and entry. Over the transept crossing is a stout central tower topped with a spire. The Doppelkirche's round, monumental design is inspired by Charlemagne's Palatine Chapel at Aachen Cathedral, since the Emperor was provided with a throne here as well. It was also based on the Church of the Holy Sepulchre in Jerusalem, as it was intended as the burial place for Archbishop von Weid.